Having presented a scattering of screenings since announcing their existence in summer 2014, the Scottish Queer International Film Festival had its inaugural full festival edition last week, running from 24-27 September and opening with the entirely enjoyable, Dyke Hard. Ushered by fabulous pink poodles into CCA theatre, audiences then saw the SQIFF team share the spotlight before the screening, introducing their inclusive ethos by explaining their use of subtitles, British Sign Language interpretation, wheelchair accessible venues and gender-neutral facilities wherever possible. Such a positive attitude to their visitors is a very welcome aspect of SQIFF, and shows their commitment to encouraging engagement from the entire queer spectrum. At Dyke Hard, director Bitte Anderson was present alongside key cast members (appearing in character) to prepare the audience for a low budget B-movie, but her almost apologetic assurances were unnecessary because the film was a thrill from start to finish. The plot sees the titular band formed in high school but fall on hard times when nasty lead singer, Riff (Lina Kurttila) abandons them. 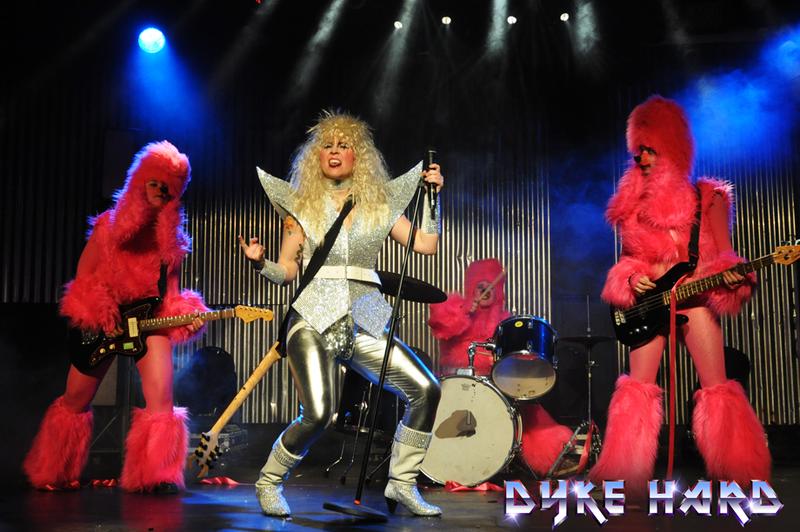 When their manager also dumps them and their mobile home is blown up, Dyke Hard members Peggy (Peggy Sands), Scotty (Maria Wågensjo) and Bandito (Alle Eriksson) hit the road aiming for TV’s battle of the bands. Along the way, a Thai boxer called Dawn (Iki Gonzalez Magnusson) joins them helping them to fend off the attempts of an evil millionaire called Moira (Josephine Krieg) to bring them down. Horny ghosts, a sadistic prison warden, bikers, ninjas, and a roller derby gang are all part of the danger Dyke Hard face on the road to musical success. This genre mish-mash was hewn from Anderson’s vision of putting all the ideas thought missing from genre film and queer cinema together in one film, and Dyke Hard certainly utilises the absurdity of the gang’s adventure to witty reflexive effect. Another key success of the film is the way it wraps up its ‘message’ at the end. To love oneself first of all, is delivered with both sincerity and sauciness. Sadly, this new Dyke Hard fan missed the rest of the weekend’s plethora of shorts, participatory events, retro screenings and parties (due to attending Berwick Film Festival) but the opening night served as a promise of more fun, action and stimulation to come. Roll on SQIFF 2016! Also viewed: Fruitvale Station (2013) directed by Ryan Coogler, an authentically sensitive impression, based on real events, leading up to the shooting of Oscar Grant III (Michael B. Jordan) in 2008. Berwick Film & Media Arts Festival (23-27 September) – installations, a very strong film programme, spooky storytelling and musical performances. Report coming soon for Sight & Sound.